Of course there are the inevitable arguments which arise against such an idea as adding VC and Entrepreneur training to the Regiment, mostly related to how this is not the role for the Green Beret on the ODA. Many argue the role of SF is purely military in nature and should not and does not include any of the other six elements of national power. While a more direct argument is this is the role of all the various and myriad agencies and organizations whose mandates are infrastructure, governance and economic development. What is the point of a development focused Green Beret if there already exist organizations, resources and bodies of practice which address what is being recommended in this series of articles? Though there are many arguments which could be brought to bear, and examples of how these beliefs are no longer valid in the Post Cold War – Post 9/11 world, I will focus my response in this article to three counterarguments. 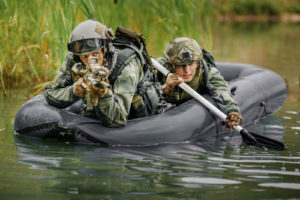 Thirdly, in the under or undeveloped parts of the world, the role of the Green Beret is to set the conditions such that disruptive new systems arise or existing systems may evolve and begin the process whereby higher level assets can get involved and bring their many resources to bear. Though many of the people we work with are uneducated, they are not unintelligent, and many are highly intelligent. When we ask them to stand up and fight, to train with us, sacrifice their lives for us, they are not fooled by empty or false promises. The former colonial powers are notorious in the former colonies for not keeping their promises, of using the local fighters to fight their wars and then leaving them with nothing but instability and a force highly trained to do nothing but fight. Of course they will work with us, we roll in with wads of funds and their governments get subsidized by the US. But do we form real, lasting and trusted relationships this way, the kind that we could put our own lives in their hands? Without demonstrating how they can personally, financially and economically benefit from working with us what kind of relationship do we establish and is it the kind that supports the interests of the modern world, or the kind that will costs us vastly more in the future? What happens to this highly trained fighting force once we leave, not having trained them also in how to support and why to support local business and to develop and foster entrepreneurship? What happens when they themselves, no longer subsidized by the US, have nowhere else to turn to earn a living, but to extorting the very same people they defended along with us? Without some training in business and how to use the Mind of the Disruptor constructively, we cannot hope they will simply lay down their arms and know what else to do to feed their family. We are too often blinded by the options we have available in our own developed countries which provide vastly more opportunities to our men and women who once trained to and fought on our behalf. Only when the individual understands the economic advantages and personal freedoms my child has, came from and are extended by the same sacrifices our own people made and are making. When they understand it was and is our defense and support of the entrepreneur and investor and not the central government, which makes our country so successful. This is when we develop real entanglement of purpose, interest, only then will the local people begin the process, many times by putting themselves and their families in real danger, of creating stability and the conditions for sustainable systems to arise. All of which is critical before system based assets can get involved. If we lead with NGO’s, CA, USAID, State Department and other System based assets, before enough knowledge transfer and development has occurred all we generally create is another welfare state, or worse, prop up ineffective or abuse regimes. Welfare states tend to only perpetuate conflicts as there is no incentive on the part of the state, to win. If they win, the checks dry up, the current elite are no longer supported by US dollars. Before the immense resources of the System can be brought to bear we have to provide an alternative reason to win, develop the conditions and transfer the knowledge such that actual, non-welfare state, economies exist, even if only in nascent form. An expanding economy, and the benefit in growth of such spread amongst a large enough slice of the population, is the only real incentive to aggressively pursue the end of a conflict (sic, sacrifice two of your four sons). And that requires the judicious application of both Minds. Just as in our advanced economies, it is not government agencies or NGO’s or the Mind of the System which create, drive, evolve or sustain the economy, though they certainly play an important role. It is the collection of individuals, each with Mind of the Disruptor derived innovative business ideas and the energy to make them a reality, that is the real driving force of economic development. There can be no doubt the thinking, resources, knowledge, relationships and protection of the System is required for success, but this does not come into account until a certain degree of due diligence and development has occurred. The intelligence and power of these System assets and the individuals who represent them, is not in understanding what needs to come into existence or be supported, but rather in knowing which resources are available and how to apply them once the right entities and individuals to support have been identified. And at this entry-level, it is the Green Beret in the community, at the very base level, who is conducting that due diligence and identifying how supporting such local entities and individuals will meet tactical and strategic needs. And it is the SF Operator, building relationships with local individuals and Host Nation counterparts, who is setting the conditions for the larger, more resourced entities to get involved and take things to higher levels of development and stability. I am sure my thinking is wrong, that it is all far more complex than I am capable of understanding. I am certain there are those out there, far more intelligent than I, who have the mixed basket of right answers. But since the birth of my child, since becoming a father, I cannot stop thinking as a father. As a father I don’t care about all those ethereal and higher ideals and beliefs, about ideology or politics. All I care about is the future for my child. And when I look in the eyes of the fathers here, I see the very same desire for a better future for their children, and telling them to fight with and for me is not enough to build a real, sustainable and trusted relationship on. I have to be willing and able to use the Mind of the Disruptor when applying Mind of the System assets and resources, to establish or improve the local economy which in-turn improves the standard of living for the local father who is standing next to me as the bullets and RPGs fly around us. Reprinted With Permission: Irregular Warfare and the Two Minds of the Venture Capital Green Beret. Small Wars Journal, June 2012.